From Anonymous of Houston, Texas on 3/8/2019 . The look a bit pale and weird, but the texture and flavor is good. None of us really like real sea food, but since I'm always looking to support gluten-free vegan food and companies that make alternatives for people like my family, I figured "Why not?! The Toona is pretty good!" Just like I remember in my childhood, but doesn't make us feel weird and gag like real fish or crustaceans often do. From Anonymous of Fullerton, California on 7/17/2018 . I am very satisfied with this healthy alternative to crab cakes. Being vegan can be made with unhealthy ingredients. 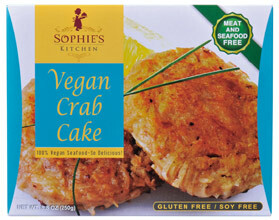 Not these crab cakes from Sophia’s. The calories are reasonable for each serving compared to other recipes. The best part is no soy! From Anonymous of Chicago , Illinois on 9/10/2017 . I popped crab cakes in oven and after 15 mins they were still very light so I reheated for 10 mins. Well, pretty disgusting. Insides reminds me of shredded coconut and I hate pulling shreds out of my mouth. I'm going to try and pan fry them. I cant see how it would hurt. From Amy Zimmerman of Manalapan, New Jersey on 9/12/2016 . I was so disappointed when I ate(ahem, attempted to eat) these faux crab cakes!!! Crab cakes are one of the things I miss the most about being a vegan and these didn't measure up. The texture wasn't stringy enough and they weren't fishy enough. From Anonymous of Fredericksburg, Virginia on 2/15/2016 . I ran across these in one of the local markets that has the largest vegan selection in my area. I though I'd give them a try and I'm telling you: being from the east coast and eating crab cakes all of my life.... These are WONDERFUL and I could not ask for a better flavor or texture in a plant based recipe. I am so happy that my vegetarian lifestyle now has even more deliciousness added. Allergens This item is manufactured in a facility that also processes soy and tree nuts.